Why Giacomo Bonaventura Is Worthy Of An Azzurri Call-Up – AC Milan Bros.
Giacomo Bonaventura made the late Deadline Day 2014 switch from Atalanta to one of Europe’s most successful clubs in Milan last summer. An all-around solid debut campaign with the Rossoneri in 2014-15, the 26-year old versatile playmaker has his sights set on making the next leap in his career as he aims to prove his worth as a candidate for Italy’s Euro 2016 squad that looks to travel to France next summer. Giacomo Bonaventura has proven that he is worth more than the 6 million euros Milan dished out for him last September. After selling off youngster Bryan Cristante to Benfica in a rather suspect move, it was Bonaventura who arrived ready to make the fans forget about the teenager despite his upside. Jack, as he is known to many, has begun to follow up his first season with the club by showing once again his versatility, creativity and attacking ability. In a 14-15 campaign in which the former Padova man played a combined 36 matches in Serie A and Coppa Italia play, Bonaventura tallied 7 goals and five assists to his name, being a key performer for then manager Pippo Inzaghi. Despite the disappointing season for the club, the Italian always took to the pitch with passion, energy and devotion to earning the result. Entering the summer of 2015, there were many question marks surrounding the club, from ownership to the manager and down to the squad. Players departed and players arrived yet some people seemed to forget the talented Bonaventura who has become a fan favorite in just over one season of play. Andrea Bertolacci made the lucrative move to the San Siro from Roma and talks of Axel Wistel and Geoffrey Kondogbia flooded the Twitter feeds of the Milan faithful. However, neither Witsel or the current Inter midfielder arrived to the club leaving the door open for Bonaventura to make a clear statement to everyone: his starting spot should be written in permanent marker. This season, Bonaventura has been asked to play in several different roles once again and thus far is proving to Siniša Mihajlović that he can be trusted anywhere he is needed on the pitch. The left side of the three-man midfield or behind the strikers in a creative role, Bonaventura has shined and appears ready to have a stellar season with the red and black. In just 6 Serie A matches this season, the 26-year old has scored twice while also assisting 3 times. He is on pace to exceed his goal tally of last season and potentially have his best season yet as a professional footballer in the prime of his career. So if you have watched Giacomo Bonaventura play for Milan week in and week out, it’s clear that he is deserving of a call-up to the Italy squad managed by Antonio Conte, right? Bonaventura has only made two total appearances for Italy. Yes, two. His two lonely appearances came against San Marino back in May 2013 and Albania November 2014 in friendlies. 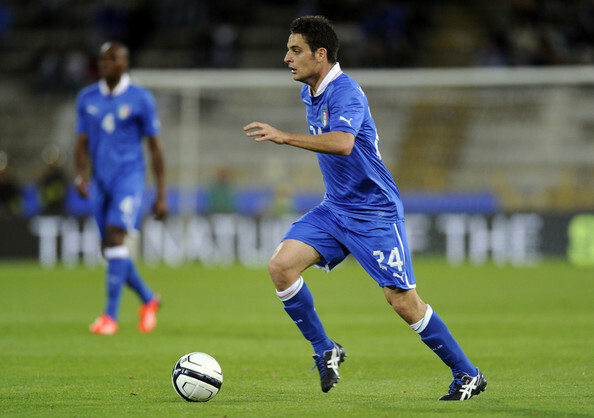 Giacomo Bonaventura against San Marino in an International Friendly on May 31st, 2013. Now of course Italy has many midfield options to choose from in the likes of Pirlo, De Rossi and Verratti among others. However, given the versatility of Bonaventura and his play over the past few seasons in Italy’s top flight, you’d think Conte would give him a shot as he looks to cement his squad in preparation of next summer’s Euro 2016 in France. Jack, in his favor, is easily capable of playing as a winger, trequartista or a traditional midfielder which certainly opens up more opportunities than a Roberto Soriano for example who is limited in where he can play. Call it bias from a Milanista but at a major tournament, I’d love to have a Bonaventura available and ready to play in several formations, from a 3-5-2 to a 4-4-2. At these major tournaments, adjustments need to be made instantly or else you’re headed home early which was the case for Cesare Prandelli’s side at the 2014 World Cup in Brazil. Sometimes, we see managers lean too heavily on players they are fond of and get burned by it. There has to come a point and time where a coach must put favoritism aside and call upon a new face. Giacomo Bonaventura brings an awful lot to the table as a player and its obvious from what we have seen over the past few seasons. He isn’t a superstar nor does he possess the best ability in Europe. He is a fundamentally sound, smart and hard-working player who provides energy and a work rate few can surpass. This month, Conte and his men will wrap up their European Qualifying when they take on Azerbaijan and Norway. The Azzurri currently sit at the top of Group H with 18 pts, ahead of Norway (16 pts) and Croatia (14 pts) but Conte still has many areas to address, particularly with the striker situation. However, it will be a good chance for the former Juventus manager to see who should stay, go but also come aboard for the hopeful flight to France next summer. Giacomo Bonaventura is a staple in the Milan squad for the foreseeable future. He has earned his chance to be considered by Conte for Euro 2016 through his performances on the pitch. But will the ex-Bianconeri manager give Jack the chance to claim a seat on board Italy’s flight to France next summer?